To kick off our first search, it’s only fitting that we should type in the names of our favorite pups (and Knock Knock mascots), Maisie and Paco. The first picture that popped up was an odd banner that read “Maisie” over the words “Parallel” and “Simulation.” Huh? It appears to have been created in Microsoft WordArt (that 1998 duo-color gradient isn’t from just anywhere). So apparently Maisie was a “C-based simulation language” used at UCLA. We may be geeks, but we don’t speak computer. So we moved onto the next photo. 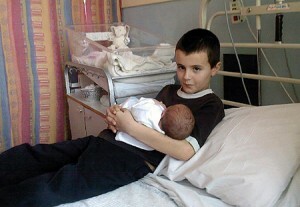 At initial glance, the picture is innocent—just a boy holding what seems to be his newborn baby sister. But after digging a little deeper, we came to find that this thirteen-year-old boy from London was said to be the father of baby Maisie. 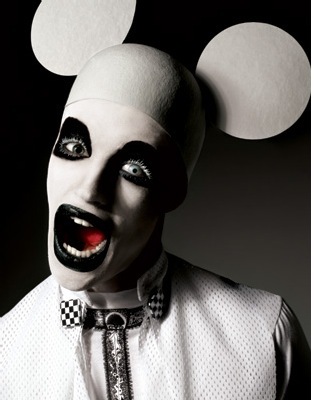 This Marilyn Manson–meets–Mickey Mouse hybrid is terrifying. (Granted, it was still beautifully shot by Paco Peregrín, a high-profile Spanish fashion and art photographer.) 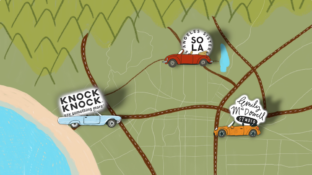 We didn’t find the rest of the campaign from which this image derived, but that’s probably for the best.